Verona is a city in the Veneto region of Italy about an hour from Venice. It's home to about 250,000 people and it is most famous as the setting of the Shakespeare play, Romeo and Juliet. If you're visiting from Venice, you'll appreciate the more relaxed setting. There are a handful of famous sites in the city including Juliet's House, which is the supposed location of the famous balcony scene in the play. Although there aren't many hostels in the city, there are a good number of affordable bed and breakfasts. Accommodation is generally more affordable than in Venice, but reservations are still recommended, particularly if you're traveling during the peak season. How much do hostels in Verona cost? A centrally located bed and breakfast in Verona, Italy. 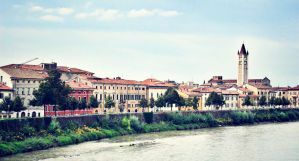 Primavera Bed and Breakfast is a charming place to stay right in the middle of Verona. The B&B's central location make it a great option if you want to explore the town. It's just a short walk from the Arena and many other famous landmarks. It's also about a kilometer from the train station. The bed and breakfast has comfortable rooms that are all furnished with televisions and each room has wi-fi. Breakfast is served every morning and includes fresh fruit, bread, cereal, milk, tea, and coffee. If you have a car, there is street parking around and a paid parking lot nearby as well. Room options include doubles, twins, and three bed rooms. A budget motel in Verona, Italy. If you're looking for a more typical motel, then Euromotel Croce Bianca is a good option. It's located at the entrance to Verona along the main road that connects Verona and Lake Garda. The hotel has 60 rooms in total and every room has its own private bathroom, air conditioning, color television, and telephone. Free parking is available as well. There's a bus that stops right in front of the hotel and travels into the city center. Also nearby are restaurants, a supermarket, a bank, and a pharmacy. An affordable bed and breakfast outside of Verona, Italy. Bed and Breakfast Happy Days is actually located in Caldiero, about 15 kilometers outside of Verona and it takes about 20 minutes to get into town. This can be a bit inconvenient, but it is a good option if you're driving and don't want to deal with parking in the middle of the city. The b&b is surrounded by vineyards and it's next to a public park, making it a great place to relax for a bit. It's a small place, with two rooms on the first floor (a single and a double) and a small three person apartment in the basement. There's also a kitchen attached to the apartment. Every morning they serve a buffet style breakfast. This is a relaxing place to stay a bit outside of town. If you're looking to get away from everything and want to be in the wine region, it's a great option.